This might not look really difficult at first, but I had some difficulties to fulfill the requirements of those two user story. The first one was almost already implemented in step 7, using CustomXML capabilities of WordML. The biggest issue I had was to figure out why when I was inserting CustomXML, the WordML format of the hyperlink was changing. It took me the most time to realize that inserting CustomXML was not the issue. The issue was proofing. Somehow inserting CustomXML was activating the auto proofing and then I got some error like on the following picture. The red underlined Brothers which is a link was the issue. In fact this simple thing change the WordML representation of the hyperlink. As I had something working I had to find a way other than adding a second way to parse Hyperlinks. 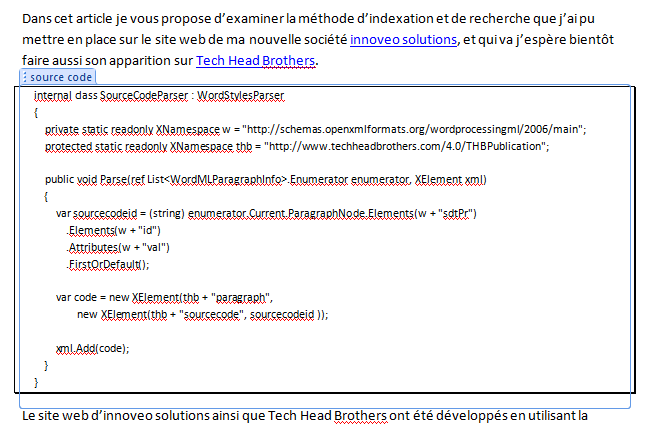 I came to the solution of disabling proofing then saving the document before making my projection to Tech Head Brothers XML. Then for sure re-enabling the proofing. Nice and easy! I couldn’t find any way to do that parsing the WordML and honestly tonight I don’t know how it is possible to go from the WordML to the CustomXML. There is still a little bug with the spacing that will solved tomorrow or later!